Rockwell Software's CPG Suite of Applications provides a foundation for deriving value added solutions for CPG Manufacturing. Opportunities will always exist to improve CPG manufacturing, but there will always be challenges to overcome. Raw material prices will fluctuate and companies will struggle to deliver margins that satisfy investors. While companies cannot control a volatile business climate, there are actions they can take to improve performance and profitability. Increase Yield & Reduce Losses - Make more finished goods with less raw material while reducing the losses associated in manufacturing. Improve First Pass Quality - Ensure the finished good is made right the first time ensuring least cost and product quality. Enhance Product Safety - Provide dependable manufactured goods that help protect your brand. 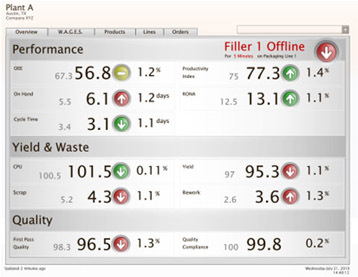 Rockwell Software's CPG Suite is comprised of 5 industry specific applications that collectively address the unique needs of CPG Manufacturers. Each application provides value onto itself or, can be deployed together to address more challenging solutions. In the CPG manufacturing environment, there is a significant amount of plant floor paperwork that contains data which collectively could contribute to great achievements in manufacturing. Effective collection of contextualized data. User role specific Key Performance Indicators (KPIs) and reports. Each application below uniquely addresses the challenges above in some way. Click on the links above to learn how our applications target each challenge, or click below to learn more about the specific benefits of each of our CPG Suite Applications.